Dr. Jurij Alschitz is one of the most well-known and popular theatre teachers who educated thousands of students working around the world. 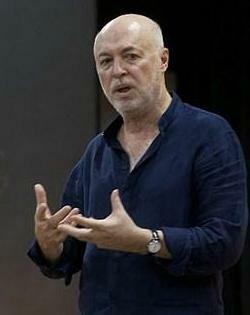 He is widely known as a researcher of the theatre, the author of many books on theatre pedagogy. He received his first director training in Moscow under Prof. J. Malkovsky, one of the then last still living pupils of K.Stanislavsky. He received his second course of training at the GITIS - the Russian Academy for Theatre Arts, under Prof. M. Budkevich and Prof. A. Vasiliev, where he subsequently held a teaching post. After numerous creations in the main cities of the Soviet Union, in 1987, he took part in the foundation of the world famous theatre ”School of Dramatic Art - Anatoly Vasiliev”, where he went on further developing his own rehearsal and training methods. Since 1992 Dr. Jurij Alschitz has been leading projects and teaching at universities and drama schools in East and West Europe, Asia, South and North America.Since 1994 he created with his master-students several theatre centres for education and research, which then formed The European Association for Theatre Culture - EATC. He founded AKT-ZENT international Theatre Centre Berlin, since 2011 appointed research centre of the International Theatre Institute. In 1999 he foundedthe international bi-annual festival for theatre training methods – METHODIKA(held in Italy, Sweden, Russia)His actual works are concentrating on the theoretical research and practical theatre training methods. In 2011 the project of Dr. Jurij Alschitz "The World Theatre Training Library“ - (WTTL) was recognized by the International Theatre Institute as one of the most important theatrical exploration nowadays. In 2012 he proposed and realized the first MA Master Programme for Teaching Professional Theatre at UNAM, Mexico; which was further developed in 2015 in coopration with European academies.During 2016 Dr. Jurij Alschitz developed a completely new so-called spherical approach to theatre education using wave and resonance theory, named “EXERCISE 40 days for 40 years”. It introduces the first Hybrid Theatre Training on the own online-platform of theWorld Theatre Training Institute AKT-ZENT, both launched in 2017. “Тренинг forever!” – 2009, 2010,Из-воГИТИС, Россия.